ESL.net sold products to over 500 libraries across the USA and Canada in 2004, and with some new product lines we anticipate that number will grow in 2005. While all of our products prove popular with libraries, the ones listed below seem to circulate better than others. For more information, ideas, or a quote, please contact us. Speak to Me is the best selling adult video course in the USA. It is available in a monolingual version "for everyone" as well as bilingual editions for speakers of Chinese, German, Korean, Russian, Spanish, Portuguese or Vietnamese. Speak To Me is intended for classroom or self-study use. The series is professional-quality and the methodologies are sound and complete. It is the best video course we have seen for beginning to intermediate learners of English. 3 levels available. $199/level OR buy all 3 levels for $495 and save $100! Talk Now! for ESL is a beginning-level language course on CD-ROM with on-screen help available in over 50 languages from Afrikaans to Zulu. Excellent for travelers who must pick up English in a hurry. World Talk picks up from Talk Now! at an intermediate level, and follows on in the same format of interactive learning with entertaining games and drills. And now for a limited time you can get Talk Now! and World Talk in a package and save $25! Available for Windows and Macintosh computers. Pictures convey meaning more clearly than words alone. The Oxford Picture Dictionary presents over 3,600 words in both English and a native language, clearly depicted on 168 pages of full-color, contextualized illustrations. Vocabulary is introduced within 140 topics, which range from basics as food, clothing, and shelter to more specific topics such as the space program, occupations, and sports. An English index includes all the vocabulary words with a clear, easy-to-follow pronunciation guide; a second index in the native language is also included. The dictionary can be used at all levels, by all ages, to teach all language skills. With the components, it provides a complete language development program - it's an invaluable resource every student and teacher needs to have. There are eleven bilingual editions of the Dictionary: Arabic, Brazilian Portuguese, Cambodian/Khmer, Chinese, Haitian Creole, Japanese, Korean, Polish, Russian, Spanish, Vietnamese, and a monolingual English edition. This software for Windows PCs lets you read, choose and edit compositions that ESL students from all over the world have written. This is the only software program that lets students work with authentic writing and authentic errors. Easy Writer will improve writing skills, entertain, and challenge students for hours. 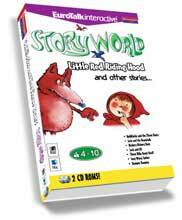 StoryWorld brings to life well known children's stories and songs to help them to build on their knowledge and use of the English language.Teaches English from: French, Norwegian, Portuguese, German, Chinese, American English, British English, Italian, Dutch, Spanish, Japanese, Danish, Arabic, Finnish, Russian, Swedish, Hungarian, Brazilian Portuguese, Greek.